Located on a fork in the road (so to speak) - Cormorant Island is at the junction of Broughton Strait, and Johnstone Strait and near Queen Charlotte Strait. The major village on the island is Alert Bay, where the majority of the population are of the Kwakwaka'wakw First Nations. Primarily, access to Cormorant Island is via the BC Ferries service - a passenger and vehicle ferry operating daily between Port McNeill and Alert Bay. An alternative method of transport is via bush plane, also from Port Hardy, Campbell River or from Port McNeill. 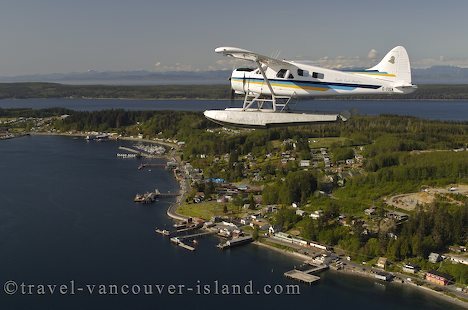 Enjoy an aerial view of the community and island during the flightseeing trip prior to landing. Aerial of Alert Bay and bush plane flying over Cormorant Island, off Northern Vancouver Island, BC, Canada. Make sure to visit this website with some amazing aerial pictures from around the world. Cormorant Island, British Columbia, Canada.